People are fascinated by TV crime investigation dramas CSI and NCIS. I’ve visited our local Office of the Medical Investigator and seen the real-world version of forensic pathology. It’s not what they show you on television. That’s why it’s so refreshing to read MORGUE: A Life in Death by Dr. Vincent DiMaio and Ron Franscell (St. Martin’s Press, May 2016). Dr. DiMaio is a forensic pathologist who’s performed more than 9,000 autopsies and is an internationally renowned expert on gunshot wounds. Medical examiners are trained doctors who go through four years of undergraduate college, four years of medical school, three to four years of training in pathology and a one-year fellowship at one of 36 approved medical examiner offices. Plus, they have to pass an American Board of Pathology certification examination. The medical examiner’s job is to determine how and why a person died – known as the cause and manner of death. The cause would be the injury or disease that kills a person. The manner is one of the general ways a human can die – natural causes, accident, suicide, homicide or “undetermined,” those times when the manner can’t be pinned down. DiMaio came from a family of doctors and he literally had a life in death. His father, a dedicated forensic pathologist, became the fourth Chief Medical Examiner of New York City. As a youngster, DiMaio remembered being taken along to hospitals and morgues with his father. He also had an early interest in guns. How ironic, since gun shot wounds would turn out to be his area of expertise. DiMaio testified as an expert witness in trial of George Zimmerman for the killing of Trayvon Martin, participated in the exhumation and examination of Lee Harvey Oswald, and worked to obtain justice for the victims of serial killers and those wrongly convicted of murder. As a medical examiner fellow in 1970, he autopsied two associates of Black Power movement leader H. Rap Brown. The men were killed in an untimely explosion of a home made bomb while driving the streets of Bel Air, Maryland prior to a scheduled trial for Brown. Elected coroners are often small-town morticians or cemetery workers whose daily contact with death makes it easy for voters to assume (incorrectly) that they are perfectly suited to the grim tasks of autopsies, blood work, body handling, and the occasional exhumation…. What was good for the tenth century is apparently still good for the twenty-first. And even in America today, when we have far more forensic tools than my father had when he became a doctor in 1940, the chances of a smart killer getting away with murder are higher in an elected coroner’s jurisdiction than any jurisdiction with a medical examiner. … I look for those tiny bits of truth that death leaves behind. Forensic science can see what ordinary humans often cannot, but science isn’t enough. We need credible, honorable people to explain it all. Good men and women must interpret science for true justice to happen. The book takes you into crime scenes, courtrooms and the morgue, illustrating autopsies that reveal the truth about mysterious deaths. It’s a fast, fascinating read. Other stories include those of women who killed children because they liked getting the attention of seeming to save them (known as Munchausen by proxy), a death in record producer Phil Spector’s palatial Hollywood home and the trial that followed, and the curious death of Vincent Van Gogh. Despite the popularity of CSI and NCIS, there’s a shortage of forensic pathologists. It’s a complicated, un-glamorous job, and medical examiners make a lot less money than hospital pathologists. There are only about 500 board-certified forensic pathologists working in the U.S. today. DiMaio hopes that MORGUE: A Life in Death will help raise awareness and interest in a job that plays such a key role in today’s justice system. 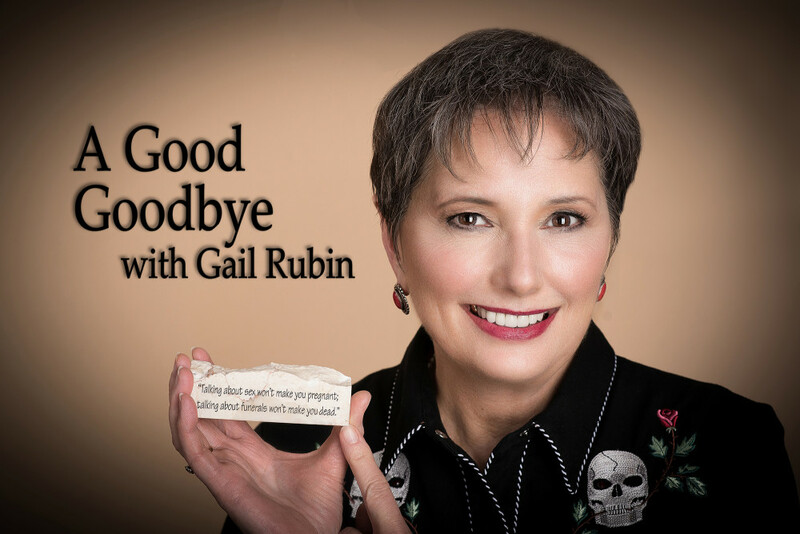 Gail Rubin, CT, is a death educator who uses humor and funny films to teach about end-of-life topics. An award-winning speaker, she “knocked ’em dead” at TEDxABQ in 2015 (https://youtu.be/r9qR4ZiGX2Y). The author of A Good Goodbye: Funeral Planning for Those Who Don’t Plan to Die and Hail and Farewell: Cremation Ceremonies, Templates and Tips, her newest book is Kicking the Bucket List: 100 Downsizing and Organizing Things to Do Before You Die (October 2016, Rio Grande Books, www.NMSantos.com).